is this 3 hole punched, and if not.. can it be three hole punched? 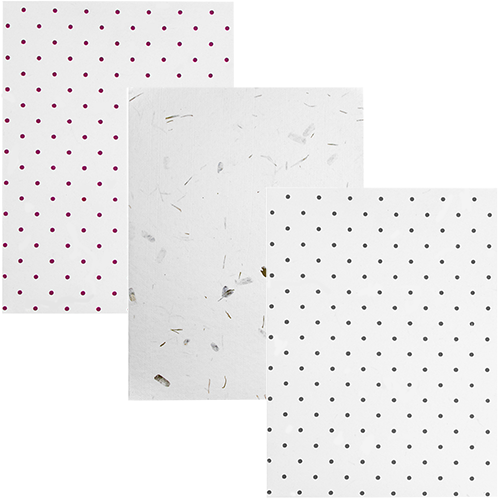 These are not hole punched and unfortunately we cannot hole punch products. You would be able to hole punch them yourself though, just make sure you use a strong hole puncher. Show off your appreciation for fashion AND the environment with our Handmade Folders with Designs! These unique Handmade Folders are made in India from 100% post consumer cotton fiber and give your papers a natural and organic look. These unique folders can dress up any report or presentation, making them effective marketing materials. They'll keep your files organized and safe. From polka dot designs to embedded threads to fern leaves, you are sure to make a valuable statement with any choice you pick. We have over 5 different designs including black, white, and ivory covers to keep your professional look but also stick to your natural style. Handmade Folders measure 9 x 12 and can hold up to 75 sheets of standard size letter paper (8 1/2 x 11). And with two pockets you can separate whatever you'd like. Carry this around campus or around the office and get noticed! Please Note: We have limited availability for Handmade Folders. Ensure yours by ordering one today.